Successfully Added Remax Smartphone Holder - Silicone Anti Skid Base, DIY Design, Fits All Phones, Charging Base Dock to your Shopping Cart. The Remax Car Holder is the perfect electronic gadget for in your car. Holding your smartphone in place while simultaneously charging it, it offers a great platform that can be used to hold your phone when your passengers enjoy a movie on the road, or simply for when using your smartphone as for navigation purposes. Its extra tough silicone body features an anti-skid base, allowing you to conveniently place it on your dashboard without needing to worry about it sliding off and dropping your phone. Additionally, it features a DIY design that lets you personally assemble the base to meet the size of your smartphone – ensuring that, no matter the smartphone you’re using, it will always fit perfectly in this multifunctional car smartphone holder. Besides functioning as a regular car holder, this useful electronic gadget furthermore features a magnetic charging cable through which it is capable of instantly charging your smartphone. Therefore, the next time you head out on the road and use your phone for navigation, you no longer have to worry about running out of juice. Additionally, it provides your passengers with a great way to watch their favorite movies in the car as from now on they will no longer need to personally hold their phone whilst enjoying media on the go. 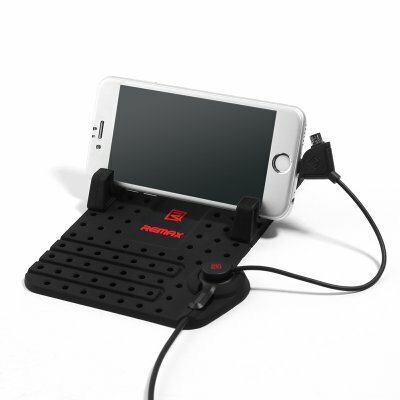 Supporting both Android and iOS devices, this car holder and charging deck can be used with the vast majority of smartphones on the market. Simply adjust the design to fit the size of your devices, plug it in, and you’ll be able to conveniently and safely use your Smartphone for navigation throughout your upcoming road trips without physically needing to hold it in your hand. The Remax Smartphone Holder comes with a 12 months warranty, brought to you by the leader in electronic devices as well as wholesale electronic gadgets..